Oil painting of trees and a meadow in subtle, pleasing colors with a nice, vintage frame. Signed in the right corner ‘Ethel Lomasney’. Research reveals she was a resident painter of Minneapolis and later settled in Brown county, Indiana in 1941. 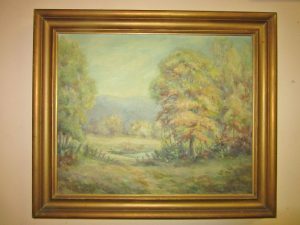 She was a member of the Indiana Artists’ Club and the Brown County Art Gallery Association from 1943 to 1959.